MI-3 Is Now Closed | 10,000 Cap Has Been Reached - Gateway to Canada | Canada Immigration Consultancy! The cap fro MI-3 has been reached. 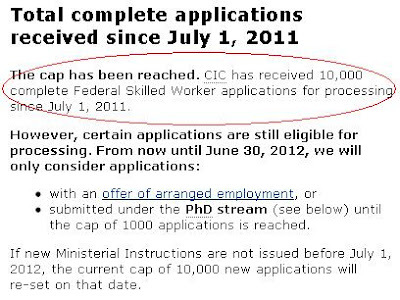 Citizenship and Immigration Canada has received 10,000 complete Federal Skilled Worker applications for processing since July 1, 2011. 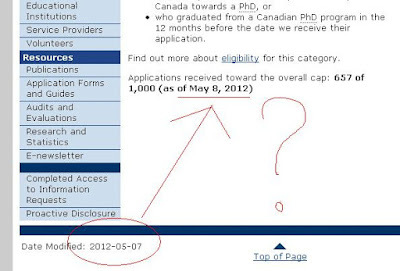 This means, they will no longer accept new applications until June 30, 2012. This page was supposedly updated May 7, 2012 but information posted in that page pertains to report dated May 8, 2012. I don't know how to explain that. 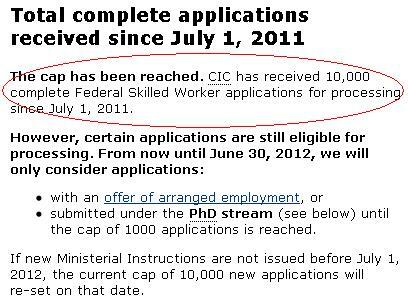 If new Ministerial Instructions are not issued before July 1, 2012, the current cap of 10,000 new applications will re-set on that date.